Brooklyn Music School’s vision is: “To make it possible for everyone, regardless of their background and resources, to be able to experience the joy of music and the artistic and intellectual benefits of musical performance." In order to remain relevant, BMS needs to continually raise the bar of the quality and the breadth of the offerings it provides and find new ways to bring the excitement of artistic discovery to the next generation. These Advisory Board members have generously agreed to contribute their time and wise counsel to moving BMS forward. Our Advisory Board plays a key role in helping BMS to continually enrich our educational and artistic offerings, improve our pedagogical approach, increase our visibility in the community, and refine our strategy. Our Advisory Board activities are coordinated by BMS Advisory Board Director, Peter Argondizza. Hanna Arie-Gaifman’s serves as the Director of 92nd Street Y’s Tisch Center for the Arts, a 141-year old cultural organization and community center, where she draws from her experience as a dedicated pianist, a literary scholar and an arts manager who has supervised orchestras, academic programs and music festivals. Her intellectual and geographic travels have led to relationships with some of this century’s greatest cultural figures, including Václav Havel, Madeleine Albright, Allen Ginsberg, Arthur Miller, Vladimir Ashkenazy and Isaac Stern. In the United States, Arie-Gaifman has taught at University of California, Berkeley and at New York University. Since her arrival in 2000, Arie-Gaifman revitalized 92nd Street Y’s concert series and carved a distinct place for it among the many first-rate presenters in New York. Her goal has been to give audiences new perspectives on the classical repertoire. She does this by offering unusual combinations of works that highlight subtleties of each piece, by pairing established and emerging artists to create an exchange of experience and energy, by presenting rarely heard international artists and underplayed repertoire, and by creating programs with scholarly commentary that shed light on the intellectual and historical roots of the repertoire. 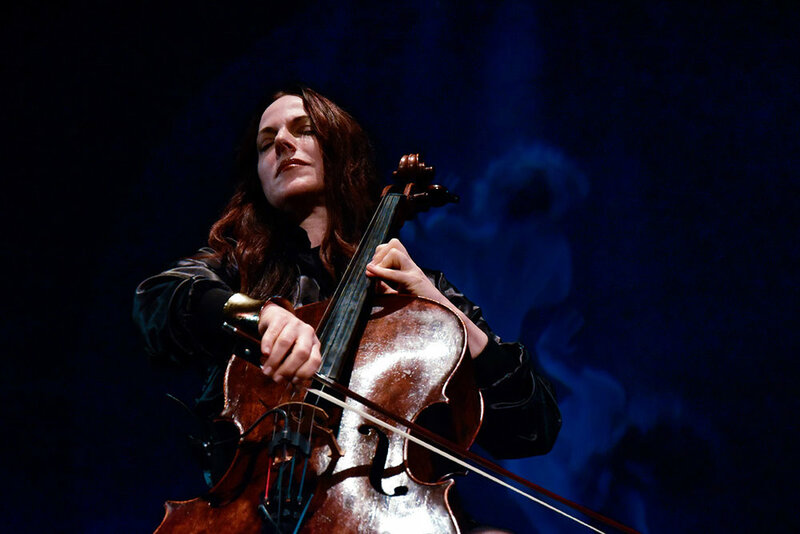 Avant-garde cellist and multifaceted artist Maya Beiser defies categories. She has captivated audiences worldwide with her “consummate virtuosity” (The New York Times) and relentless quest to redefine her instrument’s boundaries. The Boston Globe describes her as, “a force of nature,” while Rolling Stone calls her a “cello rock star.” Raised in Israel’s Galilee Mountains, surrounded by the music and rituals of Jews, Muslims, and Christians, Maya has reinvented solo cello performance in the mainstream arena. A featured performer on the world's most prestigious stages including Lincoln Center, Carnegie Hall, BAM, Kennedy Center, London’s Southbank Centre, the Barbican, Sydney Opera House, and the Beijing Festival, among many others, she has collaborated with renowned artists, composers, choreographers and filmmakers across many disciplines. Maya has released 10 solo albums, topping the classical music charts with many of her recordings. A graduate of Yale University, Maya Beiser is a 2015 United States Artists Distinguished Fellow and a 2017 Mellon Distinguished Visiting Artist at MIT; Her TED Talk has over one million views. Martin Bresnick, a composer of contemporary classical music, film scores, and experimental music, delights in reconciling the seemingly irreconcilable, bringing together repetitive gestures derived from minimalism with a harmonic palette that encompasses both highly chromatic sounds and more open, consonant harmonies and a raw power reminiscent of rock. Bresnick has received many prizes and commissions, the first Charles Ives Living Award from the American Academy of Arts and Letters, The Rome Prize, The Berlin Prize, a Guggenheim Fellowship, and a Koussevitzky Commission, among many others. Martin Bresnick is also recognized as an influential teacher of composition. Bresnick was born and raised in the Bronx, and is a graduate of New York City's specialized High School of Music and Art. He was educated at the University of Hartford (B.A. ), Stanford University (M.A., D.M.A. ), and the Akademie für Musik, Vienna, and studied composition with John Chowning, Gyorgy Ligeti and Gottfried von Einem. He went on to teach at the San Francisco Conservatory of Music, Stanford University and the Yale School of Music. Winner of a 2015 Rome Prize and a finalist for the 2014 Pulitzer Prize, the Brooklyn-based composer Christopher Cerrone is internationally acclaimed for compositions characterized by a subtle handling of timbre and resonance, a deep literary fluency, and a flair for multimedia collaborations. This season Cerrone has world premieres of his new string quartet with Calder Quartet for the LA Phil; a new percussion quartet for Miller Theatre as part of a Cerrone Composer Portrait performed by Third Coast Percussion; and a violin concerto for Jennifer Koh and the Detroit Symphony, led by Leonard Slatkin. One-sixth of the Sleeping Giant composer collective, Christopher Cerrone holds degrees from the Yale School of Music and the Manhattan School of Music, and is published by Schott NY and Project Schott New York. Nels Cline is a New York-based guitarist and composer. Known to many as Wilco's lead guitarist, Cline's vast catalog spans four decades and explores many corners of the jazz, rock, punk and experimental genres. Born in Los Angeles CA in 1956, he grew up with his twin brother Alex as a rock 'n roll obsessive before becoming immersed in the world of so-called jazz and improvised music after hearing the music of John Coltrane. He has played on over 200 recordings and performed and recorded with a wide variety of artists such as Charlie Haden, Julius Hemphill, Tim Berne, Yoko Ono, Thurston Moore, Mike Watt, Mark Isham, Ricki Lee Jones, Lee Ranaldo, Joan Osborne, Phil Lesh, Jim Black, Elliott Sharp, Anthony Braxton, and Julian Lage, to name but a few. He has released dozens of recordings as a leader since the 1980s. He has led his band The Nels Cline Singers since 2001, generating several recordings and performing worldwide, and collaborates with improvisers in projects too numerous to mention here. Nels has also composed larger commissioned works such as "Dirty Baby", which combined his compositions for two large ensembles with the paintings of Edward Ruscha and the poetry of David Breskin. Costanzo has appeared with many of the world’s leading opera houses including the Metropolitan Opera, Lyric Opera of Chicago, San Francisco Opera, English National Opera, Houston Grand Opera, Opera Philadelphia, Los Angeles Opera, Canadian Opera Company, Glyndebourne Opera Festival, Dallas Opera, Teatro Real Madrid, Spoleto Festival USA, and Finnish National Opera. In concert he has sung with the New York Philharmonic, Berlin Philharmonic, San Francisco Symphony, London Symphony Orchestra, Cleveland Orchestra, and National Symphony Orchestra, among others. He has performed at a wide-ranging variety of venues including Carnegie Hall, Versailles, The Kennedy Center, The Metropolitan Museum of Art, National Sawdust, Minamiza Kyoto, Joe’s Pub, The Guggenheim, The Park Avenue Armory, and Madison Square Garden. Costanzo is a Grand Finals Winner of the Metropolitan Opera National Council auditions and won first prize in Placido Domingo’s Operalia Competition. He was nominated for an Independent Spirit Award for his role in a Merchant Ivory film. He has begun working as a producer and curator in addition to a performer, creating shows for National Sawdust, Opera Philadelphia, the Philharmonia Baroque, Princeton University, WQXR, The State Theater in Salzburg, Master Voices and Kabuki-Za Tokyo. Costanzo graduated from Princeton University where he has returned to teach, and he received his masters from the Manhattan School of Music. In his youth he performed on Broadway and alongside Luciano Pavarotti. Aaron Copland has described Del Tredici as “that rare find among composers - a creator with a truly original gift. I venture to say that his music is certain to make a lasting impression on the American musical scene. I know of no other composer of his generation who composes music of greater freshness and daring, or with more personality.” David Del Tredici, considered a pioneer of the Neo-Romantic movement, has won a Pulitzer Prize in Music and is a former Guggenheim and Woodrow Wilson fellow. Del Tredici attended the University of California, Berkeley, where he studied piano and played primarily Romantic works, and eventually he turned his attention to study composition while at Berkeley. Head of School and co-founder of the Montessori School of Manhattan, public speaker, and author of Practical life for Parent – A Pocket Guide for Parenting Real-Life Moments. Bridie is the founder of the D.R. Project, a charitable outreach endeavor, which built and continues to fund a preschool for two and three-year-old children in the impoverished Batey Lecheria, Dominican Republic, which to date, has taken more than 200 of the youngest children off of the streets of the village. Wendy Heller, Scheide Professor of Music History, is Chair of the Department of Music at Princeton University and also serves as Director of the Program in Italian Studies. Recognized as one of the leading scholars in the field of Baroque music, Heller has specialized in the study of 17th- and 18th-century opera from interdisciplinary perspectives, with special emphasis on gender and sexuality, art history, Italian literature, dance history, and the classical tradition. Having trained as a singer at New England Conservatory before receiving her PhD in musicology from Brandeis University, Heller maintains a strong interest in performance, promoting collaborations between scholars and performer. Heller is currently the Vice-President of the Society for Seventeenth-Century Music, and serves on the editorial boards for the Journal of Musicology, Cambridge Opera Journal, Journal of Music Pedagogy, The Operas of Cavalli (Bärenreiter), the Board of the American Handel Society, and is a member of the Venetian Advisory Board for the Gladys Krieble Delmas Foundation. A recent recipient of a United States Artists Fellowship, Colin Jacobsen’s multifaceted life in music as a violinist and composer is focused in three groups: the Silk Road Ensemble, founded by cellist Yo-Yo Ma; the string quartet Brooklyn Rider, which performs at venues as diverse as Carnegie Hall and SXSW; and The Knights, an innovative orchestra of which he is founder and co-Artistic Director along with his brother, Eric Jacobsen. This past year The Knights released Azul, an album with cellist Yo-Yo Ma as well as debut performances at the Kennedy Center in Washington DC, the new Elbphilharmonie in Hamburg and the Festival de Pacques in Aix En Provence. Internationally recognized tenor, Anthony Laciura, most recently known for his role in HBO’s Boardwalk Empire, has also performed over 800 times at the Metropolitan Opera alone, not to speak for all the other 100s of performances he’s had in the US and abroad. Anthony has been performing often on stage and screen since he made his debut in a cameo role in the opera “Louise” at the age of 12. The Washington Post has called Laciura “one of the outstanding character tenors of our time.” Anthony also has experience directing operas, including “Dido and Aeneas”, “Amahl and the Night Visitors”, and “The Magic Flute” at New Jersey City University. Anthony brings a very diverse body of knowledge and experience that will be a great support to the Brooklyn Music School. Anthony holds degrees in music from Loyola University of the South and Tulane University. “Lewis is a master of shading and color, and the kind of timekeeper that could teach a clock new ways to tick,” says jazz writer Bill Kohlhasse. Internationally acclaimed drummer and composer Victor Lewis began playing drums professionally on the local scene at the age of 15. Originally from Omaha, Victor calls New York home these days and can most often be found in the city’s recording studios. He made his recording debut on Woody Shaw’s classic “The Moontrane.” Victor has also also made his mark on the burgeoning fusion and pop jazz scenes, providing the beat on records by Joe Farrell, Earl Klugh, Hubert Laws, Carla Bley and David Sanborn. From 1980 - 1991, Victor worked a lot with the tenor giant, Stan Getz. By the end of the 1980s, Victor was one of jazz’s busiest freelancers. Lewis tries to pass on his knowledge, giving private instruction to students, participating as a freelance instructor with the New School University Jazz School. 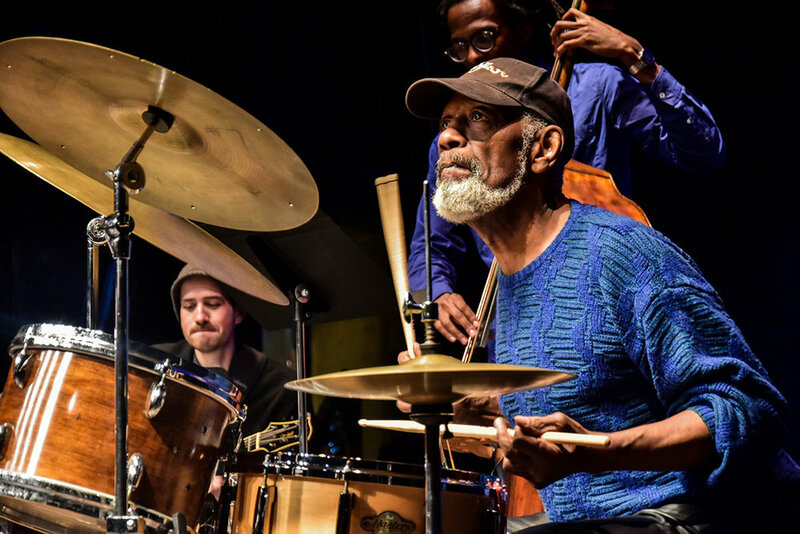 He has participated in a symposium in Modern Drummer magazine and there have been several feature articles about him in publications such as Downbeat, The Wire, Jazz Times and Modern Drummer. In 2003 Victor joined the faculty of Rutgers University in New Brunswick, NJ where he teaches drummers and coaches jazz combos. Lester Lynch, an established dramatic baritone, is known for his charismatic portrayals and commanding voice, and has mastered some of the most important baritone roles from Scarpia to Rigoletto to Count di Luna. Opera Today recently enthused, “It was booming baritone Lester Lynch who served notice that he is now in consideration for admittance to the Scarpia Preferred Pantheon - when he needed to pour it on he had the Puccinian fire power and the dramatic heat to raise the hair on the back of your neck.” An accomplished concert artist, Mr. Lynch has performed a wide and varied repertoire with orchestras across the world, including the Berlin Philharmonic, the New York Philharmonic, the National Symphony Orchestra, Houston Symphony Orchestra, Cleveland Orchestra, and the American Symphony Orchestra. Mr. Lynch has received many distinguished awards, including the Metropolitan Opera National Council Auditions, the George London Vocal Competition, and the Sullivan Awards. His work with Opera Theatre of Saint Louis earned him the Richard Gaddes Award. Elizabeth Hun (Betsey) Schmidt is the Chief Curriculum and Innovation Officer at Ascend Learning where she has led the development of Ascend’s ambitious humanities curriculum. She previously taught literature and writing at The Children’s Storefront School in Harlem; The New School; Sarah Lawrence College; and Barnard College, Columbia University. At Barnard Schmidt was on a team that developed and taught “The Literature of the Middle Passage,” a senior seminar and exchange program that brought Barnard and Columbia students and scholars to Ghana and Ghanaian scholars to New York as part of an in-depth study of the legacy of the Atlantic Slave Trade. Schmidt has published poetry, journalism, and scholarship on American and world literature widely in literary and academic publications; and she was an assistant literary editor at The New Yorker and poetry editor at The New York Times Book Review. She is the editor of Poems of New York (Knopf/Everyman) and The Poets Laureate Anthology (W.W. Norton). Schmidt has a Ph.D. in American literature from New York University and a B.A. in English from Wesleyan University. An internationally acclaimed composer, pianist and thereminist, Dalit Warshaw’s works have been performed by numerous orchestral ensembles, including the New York and Israel Philharmonic Orchestras (Zubin Mehta conducting), the Boston Symphony, the Cleveland Orchestra, the Houston Symphony, and the Grand Rapids Symphony. After becoming the youngest winner of the BMI Award for an orchestral work written at the age of eight, Warshaw’s music has been widely praised for its lyricism, unique orchestral palette, distinctive harmonic vocabulary, sense of drama, emotional intensity and vivid portrayal of character. Currently a Guggenheim Fellow for the year of 2016-17, she has just been awarded an OPERA America Discovery Grant, in addition to the Goddard Lieberson Fellowship from the American Academy of Arts and Letters, given to mid-career composers of exceptional gifts. A full-time faculty member of the composition/theory department at the Boston Conservatory from 2004 to 2014, Warshaw obtained her doctorate in music composition from the Juilliard School, also teaching orchestration there from 2000 to 2005. She currently teaches on the composition faculties of CUNY- Brooklyn College and the Juilliard Evening Division. From thrift shop basements to Carnegie Hall, from Brooklyn to Bahrain and beyond, this Grammy Award winner has been introducing new songs and reconnecting people to songs that have always been there, and still are. Referred to as “the family-music genre’s most outspoken and eloquent advocate” by Time Magazine. Dan’s widely acclaimed music has been featured on Sesame Street, Playhouse Disney, Nickelodeon, HBO Family and Sprout. Dan just completed his most recent album Lead Belly, Baby! celebrating the children music of his main inspiration - Lead Belly.